Stentorian Basilisk 200w Box Mod Review - Daily Vaping Deals & The Best Vape Product Reviews at Vaping Cheap! Resin box mods have become incredibly popular this year, and we’ve seen many be released whether being all resin or simply part resin. Vapers tend to like this type of device since they offer a unique appearance, and feel great in the hands. 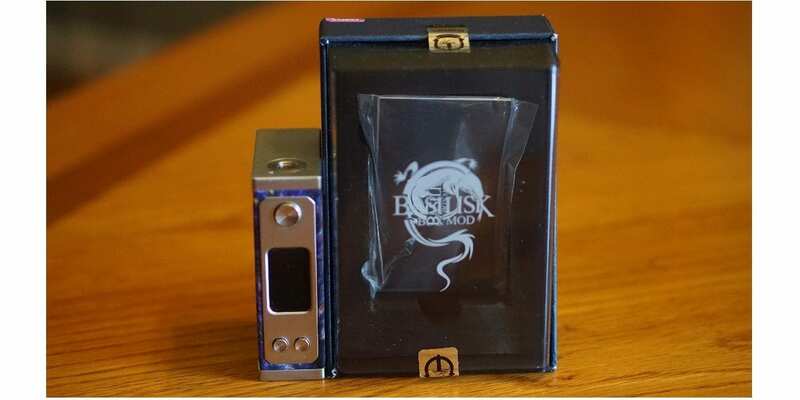 Stentorian has entered this market and released their own, the Basilisk 200w Box Mod which is powered by two high drain 18650 batteries, and keeps it simple by only offering a standard wattage mode. Before getting any further, we’d like to thank Heaven Gifts for sending this device our way for the purposes of this review. We’ll cover our first impressions, usage, performance, pros and cons, and conclude with whether or not we recommend the Stentorian Basilisk 200w Box Mod! 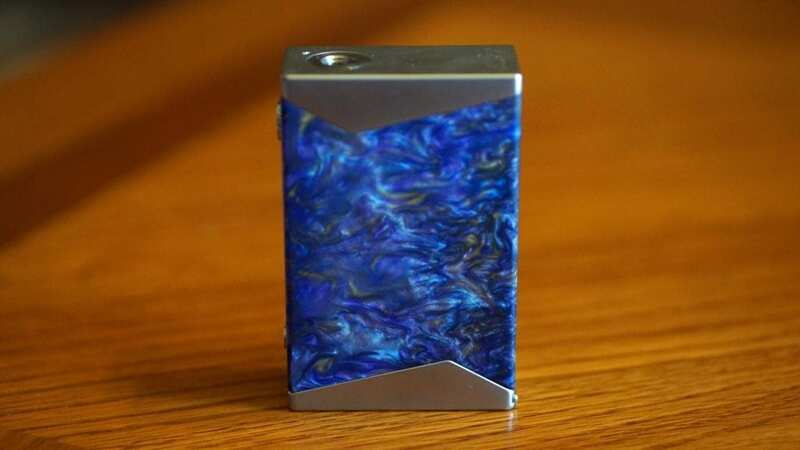 Click Here to Check Out the Stentorian Basilisk Box Mod! Upon first receiving the Stentorian Basilisk 200w Box Mod the first thing I noticed was the different packaging. Rather than coming in a box, it comes in a clear plastic case, showcasing the mod itself. This isn’t something new by any means, but it’s a nice change from the packaging we’ve seen for most other vape mods on the market. The front of the packaging also shows the Basilisk label, and on the back there’s some basic information about what’s included. The color I received was the Purple and yellow, and there’s a few more color options available such as Pink and Blue, Black and Red, Yellow and Green, and Red and Blue, giving you a total of 5 different colors to choose from. This device does feature a zinc alloy “stitching”, so you have zinc alloy located on the front plate, bottom and top of the box mod. When first holding the Basilisk Box Mod, I noticed the resin feel right away. It’s kind of hard to explain exactly what it feels like, but it’s very smooth and has a feel kind of similar to Vaporshark products. The edges of the device are relatively smooth, but I do think they can be a bit smoother. They won’t dig at you or anything when holding it, but you notice it; therefore feeling a bit “boxy” in the hands. The battery door stays into place firmly, and can easily slide open once you apply some pressure. The overall quality of this device is outstanding, and it does feel like you have something of value when you hold it. The screen itself is on the larger side for sure, which is a good thing in my book. All of the buttons are nice and clickly, giving you the right amount of feedback when pressed in. The resin does wrap around the back end of the mod as well, which is great since most resin box mods feature a resin door or panel. I do want to mention that at the top of the device on the opposite side of the 510 connection, there is a small engraving that says Basilisk in script, which is another nice touch. All in all, my first impressions of the Basilisk 200w Box Mod by Stentorian was great! The only thing I would’ve like to have seen is the edges just a bit more smoother to make it even more comfortable to hold. Using the Stentorian Basilisk Box Mod has been great over the past couple of weeks. Now this isn’t the smallest dual 18650 box mod on the market, but it’s not very large either. I would say the size is slightly above average in comparison to some of the newer dual battery mods that has been released. However, do keep in mind many dual 18650 mods have been quite small lately. Regardless, the Basilisk is pocket friendly, so you won’t have any troubles fitting this into your bag or purse. Navigating through the menu system is pretty easy as well since it only features a standard wattage mode. 5 clicks will turn this mod on and off. After turning it on, you can hold the wattage up and down buttons to lock buttons, but you can still fire it and vape. In addition, clicking the fire button and wattage down button will flip the screen. The last function you have is by pressing the fire button and wattage up button which allows you to swap through the different modes which are standard, powerful, powerful+ and rebuild. Rebuild mode is basically like a curve mode so you can control the wattage at every second while your vaping, which is handy for those Clapton coil builds! That’s all the functions there are to the Basilisk, making it easy to use for both the beginner and advanced user! Now some vapers may see this as a con since there’s no temperature control mode. Personally, I vape 90% of the time in wattage mode, so it wasn’t a big deal to me. I’ll list this as a subjective con though. The display screen is actually really easy to see and read. It is fairly bright making it easy to see in pretty much any situation whether inside or outside. 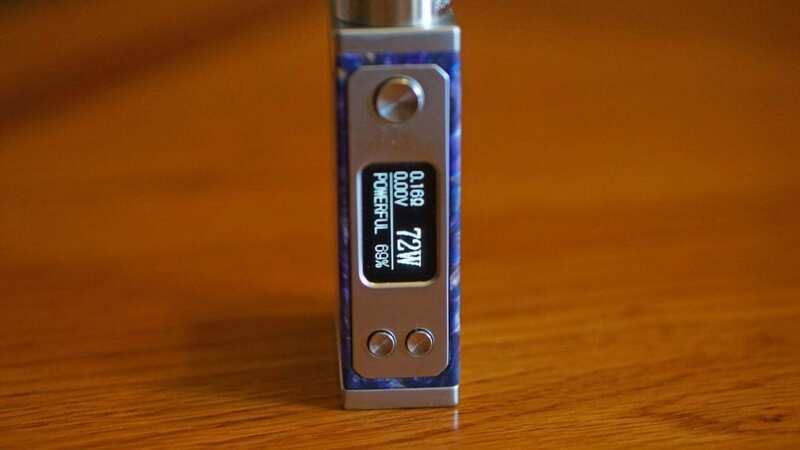 In addition, the screen does show you the current wattage, resistance of your attached atomizer, battery percentage, applied voltage and which mode you are in. Installing your batteries is incredibly easy thanks to its sliding battery door. Simply apply some pressure to slide it open, and there are clear marks to the orientation of each battery. This device is configured in series. Overall, using the Stentorian Basilisk Mod has been great with pretty much no complaints whatsoever. It’s incredibly easy to use, and even though it only offers wattage mode, it still offers a few different ramp options, which is always nice to have. Now when it comes to the performance of this device, it’s relatively straightforward since it’s a wattage only box mod. With that being said, I’m not completely sure whether or not it can hit the advertised 200w. I can say when vaping at higher wattages such as 150w and 165w in powerful mode, it certainly does feel as it’s delivering that amount of power. However, when you’re battery is drained, you will probably notice the battery sag, especially while vaping at higher wattages. I do want to mention that the Basilisk isn’t the most accurate device as well. When comparing it to a DNA box mod, it reads the resistance off by around 0.02 ohm. So if I had a 0.2 ohm coil build, it would read it around 0.18 ohm. The same can basically be said about the wattage, it feels slightly under powered, especially in standard mode, so I found myself being in powerful mode most of the time while vaping. In powerful+ mode, you will definitely notice the burst of power, which I did use for exotic coil builds such as Fused Claptons. Thankfully, I didn’t have the battery percentage issue I saw in some other reviews. While vaping, the battery percentage lowered as expected. The battery life is also pretty good, and slightly above average in comparison to other dual 18650 box mods, so that’s definitely a pro in my opinion. Although the accuracy of the Stentorian Basilisk isn’t the best, it still performed without any hiccups. So in regards to performance, I was certainly satisfied. In conclusion, the Stentorian Basilisk 200w Box Mod is a great looking device that is really easy to use, making it great for the beginner and advanced user. The resin is done incredibly well, and the build quality is second to none. Although it’s a great mod and easy to use, there were still some cons that may sway some vapers from purchasing it. For one, the accuracy is pretty off in comparison to other mods, and is probably the biggest con to be mentioned. It’s not the biggest deal since it does perform as you expect it to. The same can be said about it being slightly under powered, I found that the standard mode to be more of a “soft” mode and powerful to be standard. If this is the case, then it might not be under powered. 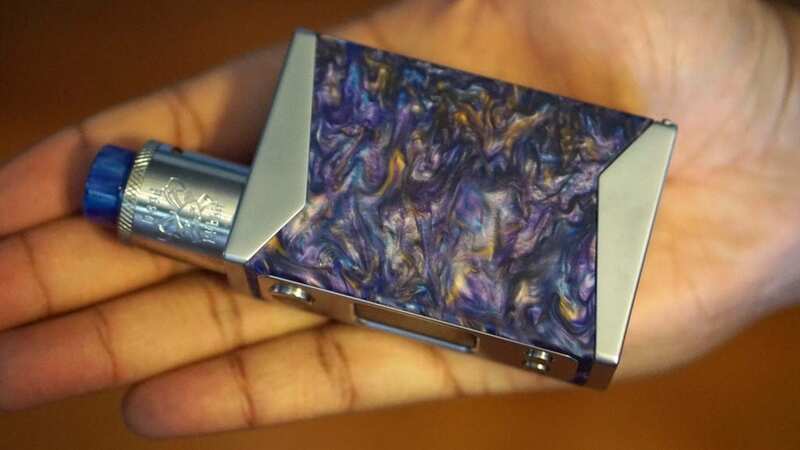 If you don’t mind these cons mentioned, and looking for a well build resin device that’s easy to use, then yes I could surely recommend the Stentorian Basilisk 200w Box Mod.